Video abstract presented by Seraj Zohurul Haque. Background: The use of Internet has now become indispensable, and the technology has revolutionized the medical education and practice worldwide. Currently, medical students and professionals have an enormous opportunity to keep them always updated with the exponential growth of knowledge because of potential progression of Internet throughout the world that enables them to become a lifelong learner. Internet addiction is a widespread phenomenon among students and academicians at universities in Malaysia. Students use the Internet for recreational purpose and personal and professional development. The Internet has become an integral part of day-to-day life of the university students, including medical students. The aim of the present study was to examine the Internet use and addiction among students of Universiti Sultan Zainal Abidin, Malaysia. Methods: This was a cross-sectional study in which a questionnaire, Internet Addiction Diagnostic Questionnaire, developed by the Center for Internet Addiction, USA, was used. One hundred forty-nine medical students of Universiti Sultan Zainal Abidin participated in this study. Data were analyzed using Statistical Package for the Social Sciences software. Results: The mean scores were 44.9±14.05 and 41.4±13.05 for male and female participants, respectively, which indicated that both the genders were suffering from mild Internet addiction. Conclusion: This study shows almost similar level of Internet usage among medical students irrespective of their socioeconomic background, with no statistically significant (p>0.05) differences, except among the years of study (p=0.007). Overall, from the research data and having worked with this cohort very closely, Universiti Sultan Zainal Abidin medical students can be labeled as wonted and recurring users of the Internet. Nevertheless, it is very difficult to define as Internet addicts or pathological users of the Internet because of small sample size and cross-sectional study. A number of studies have been conducted in this field among the university students of Malaysia, but there has been little focus on medical students, particularly in the east coast of Malaysia and at Universiti Sultan Zainal Abidin (UniSZA). The aim of the present study was to examine the Internet use and addiction among students of UniSZA, Malaysia. This cross-sectional study was conducted among the medical students of UniSZA of Year 1–5 during the academic session 2014–2015. The data were collected in October 2015. A questionnaire, Internet Addiction Diagnostic Questionnaire,38–40 developed by the Center for Internet Addiction, USA (http://netaddiction.com/internet-addiction-test/)40 was used to collect the data. Formal permission was obtained from the Center for Internet Addiction (Dr Kimberly Young) to use this questionnaire for the present study. The Internet Addiction Diagnostic Questionnaire is a widely utilized screening instrument examining compulsive Internet use.41 The questionnaire was slightly modified to add sociodemographic parameters and applied to the context of UniSZA. The simple random sampling technique was used to select the cohort. The sample size was calculated as 169 among a total of 300 medical students of Faculty of Medicine, UniSZA, using a sample size calculator.42 Another 10% was added to counter the missing value of questionnaires due to potential nonresponse, bringing the total number of subjects to 186. Unfortunately, when data were collected during a prearranged time in the lecture hall, only 149 students returned the questionnaire, with 37 students not completing the questionnaire, despite the research participants being evidently explained the purpose and personal confidentiality of the research. Mild: 31–49 points. You are an average online user. You may surf the Web a bit too long at times, but you have control over your usage. Moderate: 50–79 points. You are experiencing occasional or frequent problems because of the Internet. You should consider their full impact on your life. Severe: 80–100 points: Your Internet usage is causing significant problems in your life. You should evaluate the impact of the Internet on your life and address the problems directly caused by your Internet usage. Sociodemographic data such as age, gender, marital status, year of study, and another five closed-ended Internet-related questions were added to the original questionnaire. A pilot study was conducted on 15 undergraduate students and it was found that the survey instructions and items were easily comprehensible and suitable for the study. The students who participated in the pilot study were excluded from the final study. Most of the sections of this questionnaire demonstrated acceptable values of Cronbach’s alpha, with a range between 0.672 and 0.882, which indicated that both instruments possessed good internal consistency and reliability. Evidence of convergent validity was shown by the significant correlations between the items of each section and the overall mean in each section (rs=0.332–0.718; p<0.05).43,44 The data were then compiled and analyzed using Statistical Package for the Social Sciences Version 21 (IBM Corporation, Armonk, NY, USA). Quite a number of missing values were noted and the cases with missing values were excluded from the analysis automatically by SPSS. However, for the descriptive analysis of the sociodemographic characteristics of the participants and the questions on IA, the missing values were coded as “not known”. For conducting this research, the certificate of ethical approval was obtained from the UniSZA Research Ethics Committee (UniSZA, C/1/UHREC/628-1 (44), August 3, 2015). The UniSZA Research Ethics Committee had examined the questionnaire before the study was started and was satisfied that there were no sensitive questions. Research ethics were strictly maintained, especially regarding confidentiality. The current research was totally anonymous and voluntary. Adequate explanation concerning the purpose of the study was provided to the participants, and informed consent was obtained to utilize their data for research purposes. The sociodemographic characteristics of the participants are shown in Table 1. A total of 149 participants returned the questionnaire; giving a response rate of 80.11%. The study participants’ (SPs) mean age was 22.0±1.54 years. Among them, 40.3% and 55.7% were male and female, respectively. Most of them (81.9%) were single, and 20.1%, 20.1%, 15.4%, 19.5%, and 20.1% were from Year 1, 2, 3, 4, and 5, respectively (Table 1). The distribution of answers in the questionnaire is shown in Table 2. Majority (40.3%) of the participants mentioned that they frequently stayed online longer than they intended. Approximately 13% was always online longer than they planned. It was also found that majority of the participants occasionally neglected their household chores to spend more time online (35%), checked their emails before doing something else that they needed to do (41.8%), had their academic performance or productivity suffer because of the Internet (37.6%), became defensive or secretive when anyone asked them what they were doing online (39.6%), blocked out disturbing thoughts about their life with soothing thoughts of the Internet (32.2%), found themselves anticipating when they would go online again (35.6%), feared that life without the Internet would be boring, empty, and joyless (32.9%), found themselves saying “just a few more minutes” when online (27.5%), and tried to cut down the amount of time they spent online but failed (33.6%). Notes: Mean ± SD of total scores = 43.49±13.704 (max. = 100, min. = 20). Abbreviations: Max., maximum; Min., minimum; SD, standard deviation. The mean scores were 44.9±14.05 and 41.4±13.05 for the male and female participants, respectively. Therefore, on average, both genders were suffering from mild IA. Also, the mean scores were 39.1±11.53 and 42.9±13.46 for married and single SPs, respectively. Consequently, on average, both married and single SPs were also suffering from mild IA. It was also noted that the median and interquartile range scores of Year 1, 2, 3, 4, and 5 students were 46.5±19.75, 40.0±29.00, 43.0±13.00, 41.0±20.50, 31.0±16.75, respectively. Accordingly, all participants, irrespective of the year of study, were harmoniously suffering from mild IA. 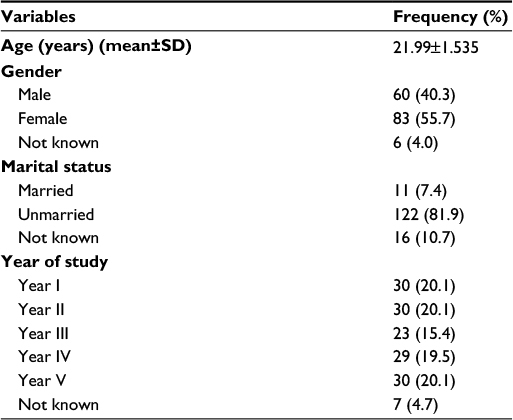 No significant differences were observed in the total scores of IA between genders (p=0.143) and marital status. 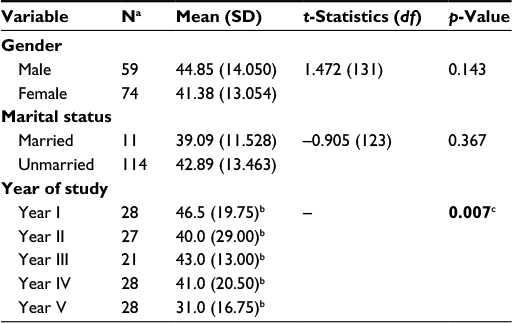 However, statistically significant (p=0.007) differences were observed among the different years of study (Table 3). Post hoc analysis of comparison of the total scores of IA test between the different years of study using Mann–Whitney U test showed that there was a statistically significant difference observed between Year 5 and Year 1 (p=0.001), Year 3 (p=0.015), and Year 4 (p=0.005) (Table 4). There was a slightly negative, but statistically significant correlation between the total scores of IA and age (r=−0.194, p=0.025), meaning the total score was lower for older participants. However, there was no statistically significant correlation between the total scores of IA and duration of daily Internet usage (r=−0.074, p=0.394) (Table 5). The association between the total scores of IA with age and duration of daily Internet usage is depicted in Figures 1 and 2, respectively. There was a slightly positive, but not statistically significant correlation between the examination grade and duration of Internet usage (r=0.085, p=0.548) (Table 6; Figure 3). Notes: aWith some missing values. bMedian (interquartile range). cKruskal–Wallis test. Bold indicates significant data. Abbreviations: df, degrees of freedom; SD, standard deviation. Note: *Significant difference was found between Year V and Years I, III, and IV. Note: Bold indicates significant data. 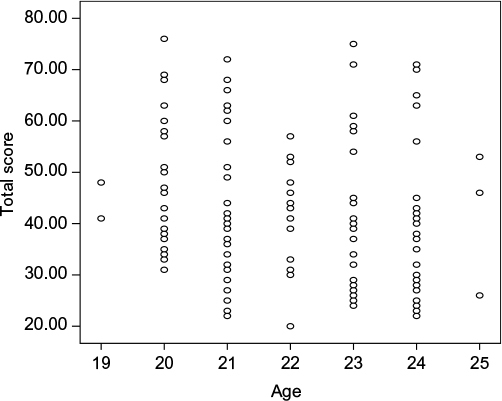 Figure 1 Correlation between total scores of Internet addiction test and age (in years). 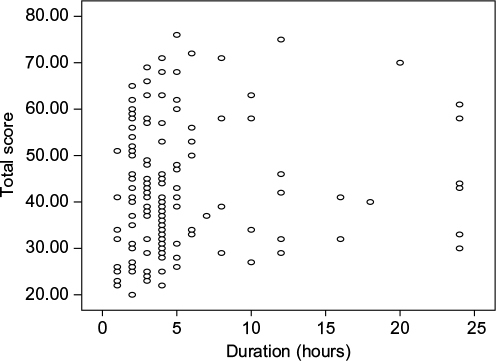 Figure 2 Correlation between total scores of Internet addiction test and duration of daily Internet usage (in hours). Figure 3 Association between examination grade (1=A, 2=B, 3=C, 4=pass) and duration of Internet usage in hours (N=147). Majority of the participants possessed two gadgets for browsing the Internet (64.4%), had one Internet connection (65.8%), got an account on Facebook (86%), and used WhatsApp for texting (74.5%). The number of social network accounts of the SPs was 0–1 (71.14% ) or 2–3 (18.79% ). 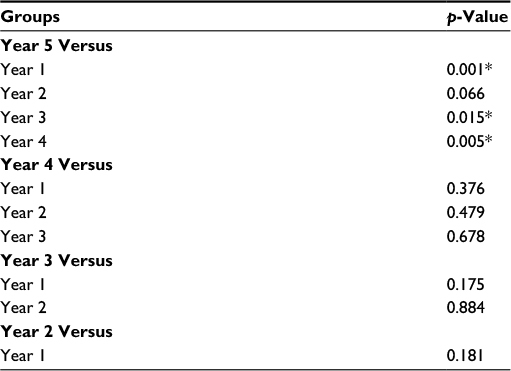 Unfortunately, none of these components showed any statistically significant difference (p>0.05) when compared using Kruskal–Wallis test and Mann–Whitney test (Table 7). Median and interquartile range are used here instead of mean and standard deviation (SD) because the variable is skewed and not normally distributed, and thus, using mean and SD will give a biased average. All participants had email addresses and the specifics are portrayed in Figure 4. It was noted that 87% and 13% of students had one and two email addresses, respectively (Figure 5), but they did not indicate their most commonly used email addresses. The reasons for Internet use included (Figure 6): social networking (56.2%), entertainment (39.7%), educational (34.9%), research (12.3%), and email communication (12.3%). Approximately half and one-third of the participants were suffering from mild and moderate addiction, respectively, and the subsequent problems resulting from Internet usage (Figure 7). It was noted that one-quarter of the students had no IA. Notes:aWith some missing values. bKruskal–Wallis test. cMann–Whitney test. dSuch as Facebook, Twitter, or others. 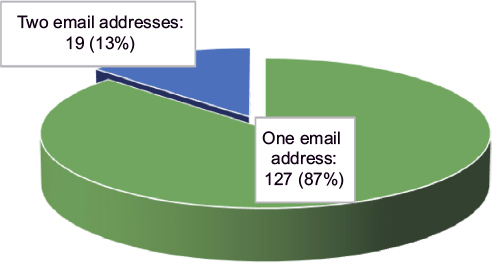 Figure 4 Email addresses used by participants (N=146). 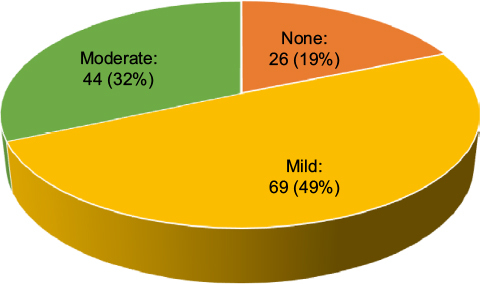 Figure 5 Number of email addresses owned by participants (N=146). Figure 6 Major purpose of using Internet (N=146). Figure 7 Distribution of severity scale of Internet addiction (N=139). There were no statistically significant (p=0.143) differences between genders. Similar insignificant differences were observed between genders in a study conducted at the Mahatma Gandhi Memorial Medical College, Indore, India.80 The mean scores of both genders were between 31 and 49; therefore, both male and female medical students of UniSZA were suffering from mild IA, but had control of the usage. Among the current SPs, 49% suffered from mild addiction; various studies from different Asian countries reported 35%, 51.3%, and 57.77% to be suffering from mild IA.28,81,82 Therefore, the current study data were quite similar to those of earlier studies.28,81,82 A study conducted among medical students of the Middle East reported that 19.1% of them suffers from a moderate degree of IA, but the figure in the present study was little higher (32%).83 Some Asian studies have reported that 0.3% and 0.9% were suffering from severe IA; nevertheless, in the present study, we were not able to detect any single medical student with severe IA,28,83 although a little positive, but not statistically significant (p=0.548) correlation was found between the examination grade and duration of Internet usage. Nonetheless, another recent Malaysian study reported that a significant (p=0.003) relationship was observed between cumulative grade point average and Internet usage during weekdays. However, there was no significant relationship between Internet usage and cumulative grade point average during weekends (p=0.677).17 Another investigation conducted among Malaysian university students found statistically significant differences in academic performance between average users and excessive users (t=−18.95, degrees of freedom = 651, p<0.001).84 Similar significant relationships were also observed in South Africa, but no relation of causality could be recognized between rigorous Internet usage and poor academic performance, even though the study results approved the negative effects on academic achievement due to abusive use of the Internet.85 Another Indian survey conducted on 500 medical students of three reputed medical institutes (Hamdard Institute of Medical Sciences and Research, New Delhi; All India Institute of Medical Sciences, Jodhpur; and Dr SN Medical College, Jodhpur) revealed that there is a significant relationship between students’ usage of the Internet and their academic performance.86 Another appraisal conducted among 400 South Asian science and technology university students found that IA had a statistically significant negative relationship with academic performance (r=−0.13, p<0.0).87 Consequently, the current study findings were in the same line as those of earlier studies of home and neighboring countries. The study has a number of limitations. This cross-sectional study involved only students of a medical school in Malaysia and had a small sample size; therefore, caution needs to be taken to generalize the findings. Moreover, as the study was cross-sectional, it was not possible to conclude a cause–effect relationship between the causative factors and IA among students. Longitudinal, multicentered studies with large sample size should be conducted to identify the trends of Internet usage among health care professional students and its likely implications on students’ learning and their physical and mental health. The present study revealed that 81% (49%+32%) of the SPs had mild to moderate IA, according to the study instrument of Dr Kimberly S Young. The study as well concludes that both male and female medical students were suffering from mild IA. It was found that the majority of participants frequently stayed online longer than they intended. Approximately 13% was always online longer than they had planned. Majority of the participants mentioned that Internet usage occasionally made them neglect their household chores and hampered their academic performance or productivity. IA is becoming more prevalent among medical students. They are among high-risk PIU groups because they use the Internet for both educational purposes and noneducational purposes. Easy access to the Internet without parental control is one of the important factors for IA among medical students. This study finding is quite alarming and demands the attention of concerned educational authorities because this is a public university and medical education is heavily sponsored by the Government of Malaysia, with almost no out-of-pocket personal and parental expenses. A good amount of studentship allowance is provided for each and every medical student for day-to-day incidentals, which actually comes from the tax money paid by the Malaysian people. Appropriate preventive and interventional strategies need to be developed to encourage rational use of Internet in order to protect the physical and mental health of the users. The authors are grateful to those medical students of Universiti Sultan Zainal Abidin (UniSZA) who participated in the current study. The authors are also obliged to Dr Kimberly S Young, an internationally known expert on Internet addiction, from the Center for Internet Addiction, for providing permission to use her questionnaire for this study. The authors also extend their heartfelt thanks to all members of the UniSZA Research Ethics Committee, especially to the Chairman of the ethical committee, Prof Dato’ Dr Ahmad Zubaidi Bin Abdul Latif, MD, MMED, FRCS, for his very kind cooperation. Dato’ Dr Latif currently holds the position of Vice-Chancellor of the UniSZA, Malaysia. The authors obtained no funding for this study. The principal author bore all the cost where necessary because of his personal interest in this particular area. Muniandy B. Academic use of internet among undergraduate students: a preliminary case study in a Malaysian University. Int J Cyber Society Educ. 2010:3(2):171–178. Teong KV, Ang MC. Internet use and addiction among students in Malaysian public Universities in East Malaysia: some empirical evidence. J Manage Res. 2016;8(2):31–47. Majumder MAA, Azim MSS, Rahman S. Technology-enhanced learning in Asia: New educational possibilities for the tomorrow’s doctors and tomorrow’s cures. South East Asia J Public Health. 2013:4(2):50–53. Ayub AFM, Hamid WHW, Nawawi M Hj. Use of internet for academic purposes among students in Malaysian institutions of higher education. Turk Online J Educ Tech. 2014;13(1):232–241. Lu X, Yeo KJ. Pathological internet use among Malaysia University students: risk factors and the role of cognitive distortion. Comput Human Behav. 2015;45:235–242. Li L, Hongli L. Definition and measurement on pathological internet use. J Dev Psychol. 2003;11(1):73–77. Xi L, Jiar YK. Depression and internet use in a sample of Malaysian Undergraduate students. J Educ Vocat Res. 2013;4(11):317–325. Niemz K, Griffiths M, Banyard P. Prevalence of pathological Internet use among university students and correlations with self-esteem, the General Health Questionnaire (GHQ), and disinhibition. Cyberpsychol Behav. 2005;8(6):562–570. Aboujaoude E. Problematic Internet use: an overview. World Psychiatry. 2010;9(2):85–90. Nayak RD. Internet addiction a comparative study between undergraduate students of India and Malaysia. Int J Indian Psychol. 2015;2(4):116–120. Saied SM, Elsabagh HM, El-Afandy AM. Internet and Facebook addiction among Egyptian and Malaysian medical students: a comparative study, Tanta University, Egypt. Int J Community Med Public Health. 2016;3(5):1288–1297. Tushar B, Swapnali K, Pooja B. Computer and internet use among undergraduate medical students. Int J Contemporary Med Res. 2016;3(5):1371–1321. Al-Dubai SA, Ganasegeran K, Al-Shagga MA, Yadav H, Arokiasamy JT. 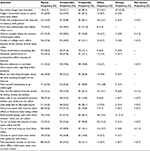 Adverse health effects and unhealthy behaviors among medical students using Facebook. Scientific World J. 2013;2013:465161. Ajuwon GA. Computer and internet use by first year clinical and nursing students in a Nigerian teaching hospital. BMC Med Inform Decis Mak. 2003;3:10. Kumar S, Tadakamadla J, Tibdewal H, Duraiswamy P, Kulkarni S. Internet usage among undergraduate dental students in India. Rev Odonto Ciênc. 2010;25(3):261–265. Ghabili K, Alizadeh M. Computer and Internet use among Iranian medical students. Med Educ. 2008;42(1):114. Siraj HH, Salam A, Hasan NAB, Jin TH, Roslan RB, Othman MNB. Internet usage and academic performance: a study in a Malaysian public university. Int Med J. 2015;22(2):83–86. Haque ATME, Sugathan S, Ali O, Islam MZ, Haque M. Use of electronic devices by the medical students of UniKL-RCMP, Malaysia, and its influence on academic performances. Natl J Physiol Pharm Pharmacol. 2016;6(1):38–45. Cash H, Rae CD, Steel AH, Winkler A. Internet addiction: a brief summary of research and practice. Curr Psychiatry Rev. 2012;8(4):292–298. Cao H, Sun Y, Wan Y, Hao J, Tao F. Problematic Internet use in Chinese adolescents and its relation to psychosomatic symptoms and life satisfaction. BMC Public Health. 2011;11:802. Griffiths M, Wood RT. Risk factors in adolescence: The case of gambling, videogame playing, and the internet. J Gambl Stud. 2000;16(2–3):199–225. Young KS, Case CJ. Internet abuse in the workplace: new trends in risk management. Cyberpsychol Behav. 2004;7(1):105–111. Liu T, Potenza MN. Problematic internet use: clinical implications. CNS Spectr. 2007;12(6):453–66. Salehi M, Khalili MN, Hojjat SK, Salehi M, Danesh A. 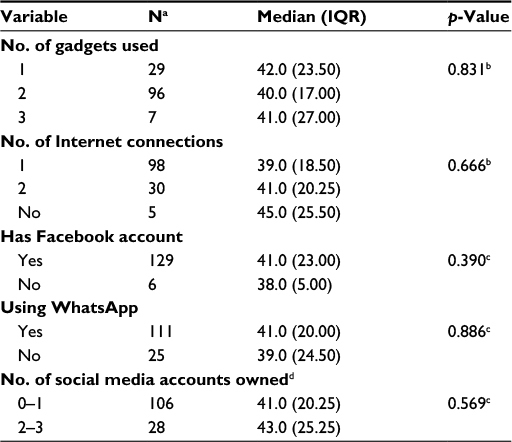 Prevalence of internet addiction and associated factors among medical students from Mashhad, Iran in 2013. Iran Red Crescent Med J. 2014;16(5):e17256. Block JJ. Issues for DSM-V: internet addiction. Am J Psychiatry. 2008;165(3):306–307. Collier R. Internet addiction: New-age, diagnosis or symptom of age-old problem? CMAJ. 2009;181(9):575–576. Pies R. Should DSM-V Designate “Internet addiction” a mental disorder? Psychiatry (Edgmont). 2009;6(2):31–37. Sharma A, Sahu R, Kasar PK, Sharma R. Internet addiction among professional courses students: a study from Central India. Int J Med Sci Public Health. 2014;3(9):1069–1073. Kandell JJ. Internet addiction on campus: The vulnerability of college students. Cyberpsychol Behav. 2009;1(1):11–17. Shaw M, Black DW. Internet addiction: definition, assessment, epidemiology and clinical management. CNS Drugs. 2008;22(5):353–365. Internet Gaming Disorders [webpage on the Internet]. A New Phenomena; 2013. Available from: http://www.dsm5.org/Documents/Internet%20Gaming%20Disorder%20Fact%20Sheet.pdf. Accessed July 5, 2015. The Daily Telegraph [webpage on the Internet]. Internet addiction is a ‘clinical disorder’. Available from: http://www.telegraph.co.uk/news/uknews/2152972/Internet-addiction-is-a-clinical-disorder.html. Accessed July 10, 2016. The Guardian [webpage on the Internet]. Addiction to internet ‘is an illness’. Available from: https://www.theguardian.com/technology/2008/mar/23/news.internet. Accessed July 10, 2016. Kim H. Exercise rehabilitation for smartphone addiction. J Exer Rehabil. 2013;9(6):500–505. Lee H. A new case of fatal pulmonary thromboembolism associated with prolonged sitting at computer in Korea. Yonsei Med J. 2004;45(2):349–351. Mok JY, Choi SW, Kim DJ, et al. Latent class analysis on internet and smartphone addiction in college students. Neuropsychiatr Dis Treat. 2014;10:817–828. Kuss DJ. Internet gaming addiction: current perspectives. Psychol Res Behav Manag. 2013;6:125–137. Young KS [webpage on the Internet]. Internet addiction: symptoms, evaluation, and treatment. innovations in clinical practice. In Vande Creek L, Jackson T, editors. Innovations in Clinical Practice: A Source Book (Vol. 17; pp. 19–31). Sarasota, FL: Professional Resource Press; 1999:1–17. Available from: http: //treatmentcenters.com/downloads/internet-addiction.pdf. Accessed July 8, 2016. Young KS. Internet addiction: The emergence of a new clinical disorder. Cyberpsychol Behav. 2009;1(3):237–244. Net Addiction [webpage on the Internet]. The Center for Internet Addiction. Internet Addiction Test (IAT). Available from: http://netaddiction.com/internet-addiction-test/. Accessed July 5, 2015. Laconi S, Rodgers RF, Chabrol H. The measurement of Internet addiction: A critical review of existing scales and their psychometric properties. Comput Human Behav. 2014;41:190–220. Creative Research System [webpage on the Internet]. Sample Size Calculator; 2012. Available from: http://www.surveysystem.com/sscalc.html. Accessed April 14, 2016. Nunnally JC. Psychometric Theory. 2nd ed. New York, NY: McGraw-Hill; 1978. Barman MP, Hazarika J, Kalita A. Reliability, and validity of Assamese version of EORTC QLQ-C30 questionnaire for studying the quality of life of cancer patients of Assam. World Appl Sci J. 2012;17(5):672–678. Pontes HM, Kuss DJ, Griffiths MD. Clinical psychology of Internet addiction: a review of its conceptualization, prevalence, neuronal processes, and implications for treatment. Neurosci Neuroecon. 2015;4:11–23. Kongsved SM, Basnov M, Holm-Christensen K, Hjollund NH. Response rate and completeness of questionnaires: a randomized study of Internet versus paper-and-pencil versions. J Med Internet Res. 2007;9(3):e25. Rahman NIA, Aziz AA, Zulkifli Z, et al. Perceptions of students in different phases of medical education of the educational environment: Universiti Sultan Zainal Abidin. Adv Med Educ Pract. 2015;6:211–222. Ismail S, Salam A, Alattraqchi AG, et al. Evaluation of doctors’ performance as facilitators in basic medical science lecture classes in a new Malaysian medical school. Adv Med Edu Pract. 2015;6:231–237. Bhagat V, Haque M, Simbak NB, Jaalam K. Study on personality dimension negative emotionality affecting the academic achievement among Malaysian medical students studying in Malaysia and Overseas. Adv Med Edu Pract. 2016;7:341–346. Haque M, Zulkifli Z, Haque SZ, et al. Professionalism perspectives among medical students of a novel medical graduate school in Malaysia. Adv Med Edu Pract. 2016;7:407–422. Ismail S, Rahman NIA, Mohamad N, et al. Preference of teaching and learning methods in a new medical school of Malaysia. J Appl Pharm Sci. 2014;4(2):048–055. Hoque R, Mostafa A, Haque M. Intern doctors’ views on the current and future antibiotic resistance situation of Chattagram Maa O Shishu hospital medical college, Bangladesh. Ther Clin Risk Manag. 2015;11:1177–1185. Haque M, Rahman NI, Zulkifli Z, Ismail S. Antibiotic prescribing and resistance: knowledge level of medical students of clinical years of university Sultan Zainal Abidin, Malaysia. Ther Clin Risk Manag. 2016;12:413–426. BBC [webpage on the Internet]. Women docs “weakening” medicine; 2004. Available from: http://news.bbc.co.uk/1/hi/health/3527184.stm. Accessed July 23, 2016. Eva EO, Islam MZ, Mosaddek AS, et al. Prevalence of stress among medical students: a comparative study between public and private medical schools in Bangladesh. BMC Res Notes. 2015;8(1):327. Tackett S, Bakar HA, Shilkofski NA, Coady N, Rampal K, Wright S. Profiling medical school learning environments in Malaysia: a validation study of the Johns Hopkins learning environment scale. J Educ Eval Health Prof. 2015;12:39. Lam SM [webpage on the Internet]. Impacts of internet addiction on youths in Hong Kong [MS dissertation]. Department of Information Technology, University of Hong Kong; 2002. Available from: http://hub.hku.hk/bitstream/10722/36923/1/FullText.pdf?accept=1. Accessed July 23, 2016. Demetrovics Z, Szeredi B, Rózsa S. The three-factor model of Internet addiction: the development of the Problematic Internet Use Questionnaire. Behav Res Methods. 2008;40(2):563–574. Widyanto L, McMurran M. The psychometric properties of the internet addiction test. Cyberpsychology Behav. 2004;7(4):443–450. Matas A. Orman’s internet addiction survey: a preliminary psychometric study in an Universitary Andalusian sample. Universitas Psychologica. 2015;14(3):1107–1116. Frangos CC, Frangos CC, Sotiropoulos I [webpage on the Internet]. A meta-analysis of the reliability of young’s internet addiction test. In: Proceedings of the World Congress on Engineering; 2012, 1:368–371. Available from: http://www.iaeng.org/publication/WCE2012/WCE2012_pp368–371.pdf. Accessed July 23, 2016. Christakis DA, Moreno MM, Jelenchick L, Myaing MT, Zhou C. Problematic internet usage in US college students: a pilot study. BMC Med. 2011;9:77. Campanella M, Mucci F, Baroni S, Nardi L, Marazziti D. Prevalence of internet addiction: a pilot study in a group of Italian high-school students. Clin Neuropsychiatry. 2015;12:90–93. Grant JE, Potenza MN, Weinstein A, Gorelick DA. Introduction to behavioral addictions. Am J Drug Alcohol Abuse. 2010;36(5):233–241. 12 Keys REHAB [webpage on the Internet]. The Relationship Between Drug Addiction, Lies and Bad Behavior; 2016. Available from: http://www.12keysrehab.com/blog/the-relationship-between-drug-addiction-lies-and-bad-behavior/. Accessed July 27, 2016. Sound-Mind Org [webpage on the Internet]. Obsessive Thinking Ending Scary Thoughts. Available from: http://www.sound-mind.org/obsessive-thinking.html#.V5hWYGh97IU. Accessed July 27, 2016. Beard KW. Internet addiction: a review of current assessment techniques and potential assessment questions. CyberPsychology Behav. 2005;8(1):7–14. Aboujaoude E, Koran LM [webpage on the Internet]. Impulse control disorders. Cambridge University Press; 2010. Available from: http://correctingconduct.weebly.com/uploads/3/9/1/9/39199717/2010_-_impulse_control_disorders_-_aboujaoude__koran.pdf. Accessed July 27, 2016. Linnoila M, Virkkunen M, George T, Higley D. Impulse control disorders. Int Clin Psychopharmacology. 1993;8:53–56. Engs RC. Cultural Use of Alcohol and Other Drugs, Alcohol and Other Drugs: Self-Responsibility. Bloomington IL: Tichenor Publishing Co; 2012. National Centre for Education and Training on Addiction (NCETA) Consortium [webpage on the Internet]. Alcohol and Other Drugs: A Handbook for Health Professionals. Australian Government Department of Health and Ageing; 2004. Available from: https://www.health.gov.au/internet/main/publishing.nsf/Content/E5203E6D5CBAA696CA257BF0001E02ED/$File/aodgp.pdf. Accessed July 27, 2016. Macrae F [webpage on the Internet]. Constant Internet access ‘causes sleep disorders and depression with late night users most likely to suffer’. Mail Online; 2012. Available from: http://www.dailymail.co.uk/sciencetech/article-2158035/Constant-Internet-access-causes-sleep-disorders-depression-late-night-users-likely-suffer.html. Accessed July 28, 2016. Lack DM. Presenteeism revisited. A complete review. AAOHN J. 2011;59(2):77–89. National Institute of Drug Abuse [webpage on the Internet]. Advancing Addiction Science. Drugs, Brains, and Behavior: The Science of Addiction; 2014. Available from: https://www.drugabuse.gov/publications/drugs-brains-behavior-science-addiction/drugs-brain. Accessed July 28, 2016. Center for Substance Abuse Treatment [webpage on the Internet]. Treatment for Stimulant Use Disorders. Rockville MD: Substance Abuse and Mental Health Services Administration (US); 1999. [Treatment Improvement Protocol (TIP) Series, No. 33.] Chapter 2—How Stimulants Affect the Brain and Behavior. Available from: http://www.ncbi.nlm.nih.gov/books/NBK64328/. Accessed July 28, 2016. Alcoholrehab.com [webpage on the Internet]. Recognize a Functioning. Addict Not All Addicts Fit the Stereotype. Available from: http://alcoholrehab.com/drug-addiction/recognize-a-functioning-addict/. Accessed July 28, 2016. Alcoholrehab.com [webpage on the Internet]. Hiding an Addiction. Available from: http://alcoholrehab.com/addiction-articles/hiding-an-addiction/. Accessed July 28, 2016. Center for Substance Abuse Treatment [webpage on the Internet]. Substance Abuse Treatment and Family Therapy. Rockville MD: Substance Abuse and Mental Health Services Administration (US); 2004. [Treatment Improvement Protocol (TIP) Series, No. 39.] Chapter 2 Impact of Substance Abuse on Families. Available from: http://www.ncbi.nlm.nih.gov/books/NBK64258/. Accessed July 28, 2016. Malviya A, Dixit S, Shukla H, Mishra A, Jain A, Tripathi A. A Study to evaluate Internet addiction disorder among students of a medical college and associated hospital of central India. Natl J Community Med. 2014;5(1):93–95. Naffise M, Mohammad A, Ahmad PB, et al. The prevalence of Internet addiction among the students of Rafsanjan University of Medical Sciences. ASEAN J Psychiatry. 2013;14(2):109–116. Chathoth V, Kodavanji B, Arunkumar N, Pai SR. Internet behavior pattern in undergraduate medical students in Mangalore. Int J Innovative Res Sci Eng Tech. 2013;2(6):2133–2136. Mazaheri MA, Najarkolaei FR. Cell phone and internet addiction among students in Isfahan University of medical sciences-Iran. J Health Policy Sustainable Health. 2014;1(3):101–105. Zainudin A, Din MM, Othman M. Impacts due to internet addiction among Malaysian university students. Int J Asian Soc Sci. 2013;3(9):1922–1928. Ngoumandjoka UT [webpage on the Internet]. Correlation between Internet usage and academic performance among university students (Masters’ dissertation). Johannesburg SF: Faculty of Science, University of the Witwatersrand; 2012. Available from: https://core.ac.uk/download/files/979/39671756.pdf. Accessed July 30, 2016. Singh B, Gupta R, Garg R. Study of Medical Students and Internet Usage. Int J Sci Res Publications. 2013;3(5):1–5. Akhter N. Relationship between internet addiction and academic performance among university undergraduates. Educ Res Rev. 2013;8(19):1793–1796.